This is the all-time best-selling series of self-talk programs. It is the “encyclopedia of self-talk” –a complete 8-volume, 32 program series that covers all of the key areas of self-talk. Each volume contains 4 self-talk programs –1 morning program, 2 daytime programs, and 1 nighttime program. Note: Individual volumes from the Lifetime Library may be ordered separately. When you order the complete set (above) you save $200. Success in life begins with how we see ourselves. Self-confidence, attitude, perseverance, and well-being, all stem from self-esteem. 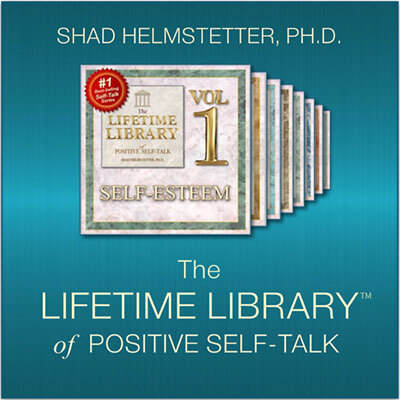 Each of the four self-talk programs in Volume 1 of the Lifetime Library build strong, positive self-esteem, and with repeated listening, that self-esteem becomes a part of who we are, and how we see ourselves each day. This volume is the foundation to successful living in every area of our lives. Knowing you’re on top, in tune, in touch, and going for it, can literally change your attitude and the outcome of your day. The self-talk in this volume will help you literally rewire your brain to be more focused, more organized, alert, and in control. The mental programs you have determine the choices you make, and the choices you make about your health and habits, literally create your fitness. The four self-talk programs in this volume will help get you on track –and into the positive daily habit of healthiness. Great for getting in shape! Your vision, your attitude, your goals, and your actions, will determine how far you go and how successful you will be. The four powerful and motivating self-talk programs in this volume will help you select the right path, reset your goals, get focused, stay on track, and achieve the results you choose in your career and in your professional growth. Listen to these self-talk programs daily. Achieving financial independence starts with a state of mind –and the right state of mind starts with your self-talk. Imagine literally rewiring your brain with a self-image of financial success! Your mental programs are subconsciously making 90% of your career and financial choices for you. The self-talk in this volume will help you make sure you have the programs that create financial success. The right balance, trust, and harmony in your relationships, can add immeasurably to the well-being to your life. The four self-talk programs in this volume give you the foundation on which positive relationships are built. Listen to these self-talk sessions regularly and watch how your relationships prosper –including your relationship with yourself. The best way to make sure you’re living up to your true potential is to have a plan for your personal growth. Imagine adding to yourself in a positive way every day. The self-talk in this volume will help you find the excellence that is you, and open the doors to the even greater future that lies ahead. The self-talk in this volume is designed to bring harmony, peace of mind, perspective, and balance into your life each day. It is self-talk that reminds you of your purpose and your value, and keeps you in touch with the most positive qualities within yourself, and in your day. This is the perfect self-talk to listen to throughout the day, and as you go to sleep at night –and prepare for an even greater day tomorrow. CONTACT US TODAY FOR A FREE 1-HOUR LIFE COACHING SESSION!